Stellar orbits that have revealed the existence of a supermassive black hole that is 4 million times the mass of the sun and that lies at the center of the Galaxy ~25,000 light years away. The Galactic center also plays host to an unexpected population of young, massive stars, whose orbits can provide insight into their origin as well as the hostile environment surrounding a supermassive black hole. 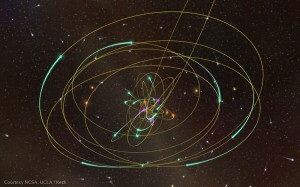 The movie shows a 3-dimensional visualization of the stellar orbits in the Galactic center based on data obtained by the W. M. Keck Telescopes between 1995 and 2012. Stars with the best determined orbits are shown with full ellipses and trails behind each star span ~15-20 years. These stars are color-coded to represent their spectral type: Early-type (young) stars are shown in teal green, late-type (old) stars are shown in orange, and those with unknown spectral type are shown in magenta. Stars without ellipses are from a statistical sample and follow the observed radial distributions for the early (white) or late (yellow/orange) type stars. These stars are embedded in a model representation of the inner Milky Way provided by NCSA/AVL to provide context for the visualization. Stuart Levy & Robert Patterson worked with a visualization of stellar orbits around a supermassive black hole that is 4 million times the mass of the sun and that lies at the center of the Galaxy ~25,000 light years away. The Galactic center also plays host to an unexpected population of young, massive stars, whose orbits can provide insight into their origin as well as the hostile environment surrounding a supermassive black hole. 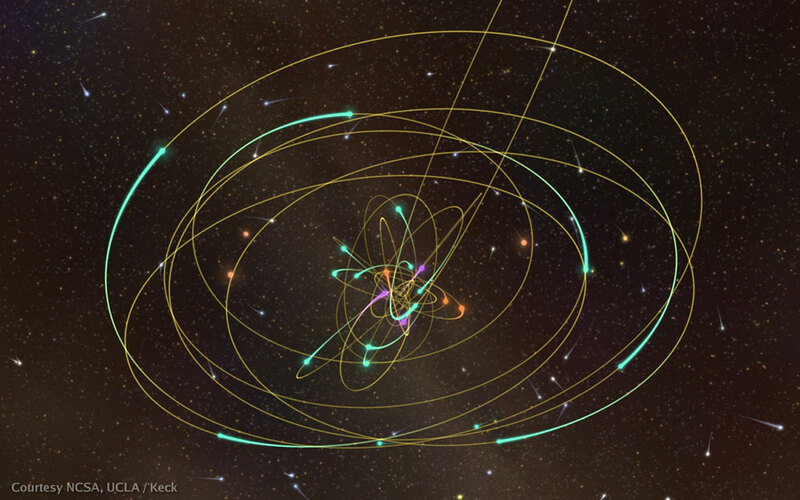 The movie shows a 3-dimensional visualization of the stellar orbits in the Galactic center based on data obtained by the W. M. Keck Telescopes between 1995 and 2012. Stars with the best determined orbits are shown with full ellipses and trails behind each star span ~15-20 years. These stars are color-coded to represent their spectral type: Early-type (young) stars are shown in teal green, late-type (old) stars are shown in orange, and those with unknown spectral type are shown in magenta. Stars without ellipses are from a statistical sample and follow the observed radial distributions for the early (white) or late (yellow/orange) type stars. These stars are embedded in a model representation of the inner Milky Way provided by NCSA/AVL to provide context for the visualization.